If you are an Ubuntu user (or Linux in general), chances are you install LibreOffice on your machine as the default office suite. Did you ever wondered if there another free office suite for Linux?. The quick answer is, yes, there is. OnlyOffice is another free office suite you can use to try a different taste of office suite in Linux, other than LibreOffice. OnlyOffice is developed by Ascensio System SIA and released as an open source software. In addition to Linux, the office is also available for other operating systems including Window and macOS. Unlike LibreOffice which uses open document format as the default file format, OnlyOffice uses the standard document of Microsoft Office. For instance, if you create a document using this tool, your file will be saved in a DOCX format by default, although you can also choose different formats like ODT and RFT. You can directly convert your document in a PDF format without needing to install additional add-on. OnlyOffice consists of three applications to create as well as edit documents, presentations and spreadsheets. It is available as both SaaS (web-based) and desktop. 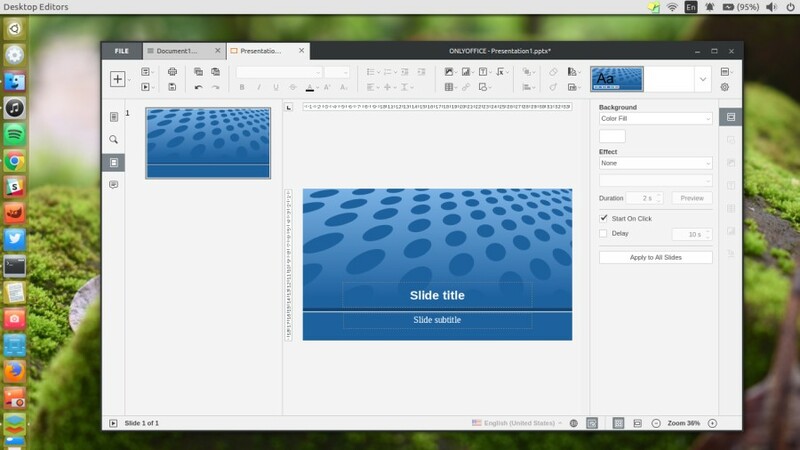 In this article I am going to show you how to install the desktop edition of OnlyOffice — which called ONLYOFFICE Desktop Editors — on Ubuntu. There are two ways to install the desktop edition of OnlyOffice on Ubuntu, via binary file and by adding the repository of OnlyOffice to Ubuntu. The first method is by making use the offered binary file, which is available in a DEB format. You can usedpkgtool to install it but first, you need to download the DEB package of OnlyOffice on its official site. Click here to download it. OnlyOffice depends on fonts-crosextra-carlito. So, before running the dpkgtool to install it, you can run the following command to install fonts-crosextra-carlito. Then, you can run the dpkgtool to start installing OnlyOffice. Be sure to run it from the directory where the DEB package of OnlyOffice is located. Then, add the following record to the /etc/apt/sources.list. You can edit the file of “sources.list” using any text editor. Be sure to login as root to make changes of this file. Next, run the following command to update the package manager cache. Lastly, run the following command to install OnlyOffice. Done, if there’s no problem during installing, you can start working with ONLYOFFICE Desktop Editors.